This article is based on a talk which I originally gave at a lunch held by Kids and Warner, Goodman and Streat, a local legal firm. I was asked to tell my 'story' and talk about the role Down Syndrome Education International has played in my family's life. My husband, Paul and I have two boys, James 14 and Joe 12. James has Down syndrome. The charity is an internationally recognised organisation, which researches and disseminates information on the development and education of people with Down syndrome. It also provides a wide range of support and advice services including assessments and consultations and helps schools and families with strategies for dealing with behavioral issues. I work at the charity, helping the psychologists with the Early Development Groups, which are fortnightly speech and language groups for pre-school children. The groups are regularly attended by approximately 75 children and their families. Whilst studying for a French degree at Leeds University, family problems abruptly overtook my studies. I left my course at the end of my first year and moved back home to Hertfordshire. At this point, I decided to train as a bi-lingual secretary. In time, things began to improve at home and I was able to move out for the second time into a flat in East London with two friends. Life in the City was bliss. I worked mainly in financial institutions and through subsidised mortgage schemes was eventually able to buy myself a flat. I adored the energy of city living and working. I met friends in wine bars after work, sat in the sun outside cafes in Covent Garden and trekked around Camden Market on cold Sunday mornings. I went to the theatre, cinema, poetry recitals, art galleries and ate Lebanese, Vietnamese and Mexican food. I felt spiritually at home in the metropolis. Eventually, I found myself working as the Office Manager of a high-profile, high-pressure financial swaps start-up company AIG Financial Products. I worked unsociable hours, earned a very good salary and received large bonuses as I was part of a team which made millions on a daily basis. In 1989, I married my husband Paul and we moved to Hertfordshire. I resigned from AIG as I wanted to spend time with Paul, although it was a huge wrench tearing myself away from the financial rewards of the job. I became pregnant within one year of getting married and after a pretty awful pregnancy, I gave birth and the girl I was hoping for turned out to be a boy with Down syndrome. I experienced what was described as a hysterical reaction during which I planned ways of doing away with the baby and myself. Alternatively, I could live in Australia and take the 'problem' away from Paul. I could swap my baby for another one in the nursery — a girl maybe. This reaction lasted for one week and then the hysteria gave way to a personal tsunami of grief combined with overwhelming feelings of love and protectiveness for baby James. In this job, a mother, there was not the luxury of resignation. I was unable to enjoy anything. I was tearful and ate continuously for comfort. My family and friends displayed mixed reactions but it seemed that a common theme was to make Paul and me feel we were special parents in some way. No number of presents and bunches of flowers made any difference to our disappointment. Throughout my life, I have peripatetically kept a diary. At this point the entries changed from city tales of sunshine, parties, club class and high heels to this. Came home from hospital today. Noticed how strong colors in the house are. Mum made salad. Stared at the wall and cried for ages. Baby not feeding well. Seeing cardiologist at Harefield tomorrow. Maybe he'll die — problem solved.' But, I'm terrified he'll die because I love him so much. Cried so much today can hardly stay awake. Love him when he's with me but can't get the bloody words DOWN SYNDROME out of my head. When he sleeps, I cry. Can't get any house work done, too tired from crying. Mum rang and I just cried. So sick of crying. Cannot stop. Put James in his own room at last today. That room was meant for a normal child not him. Don't want this, can't do it anymore. What alternative? The interminable round of appointments with therapists began very early on and I hated every single one. I found myself pouring out my story to all the therapists. But somehow the therapies gave me something to focus on. 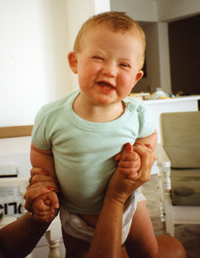 When James was 8 months old, I was diagnosed with post-natal depression and treated with drugs and psychotherapy. Life became far more bearable and sometimes enjoyable. However, I had developed an obsession with stimulating James. I spent all his waking hours entertaining, singing, reading and playing with him to the extent of taking him to the loo with me so that I wouldn't miss a second's stimulation time. When James was 2, I gave birth to another son, Joe, and the heat was taken out of my obsessive behavior. I began to get my life back on track and Paul and I started to think about James' future. 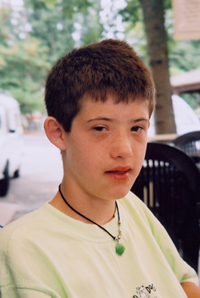 We had read about some children with Down syndrome going through mainstream education but had no idea whether James would be able to or if any mainstream school would accept him. James developed extremely well, exceeding all expectations placed on him by professionals. When James was 3, I heard Professor Sue Buckley of The Down Syndrome Educational Trust speak at a conference in Hertfordshire. Her positive attitude towards inclusion for children with Down syndrome and the evidence she provided of the fantastic achievements of children who were being educated in mainstream schools filled me with enthusiasm and hope. I cannot overstate the power of Sue's words in my emotional healing. Sue's best advice was to teach children to read from the age of two. We began immediately and on the day James started at the local village school on his 5th birthday he was already on Stage 2 of The Oxford Reading Tree. The reasoning behind teaching these children to read is that communication is the biggest challenge facing them and the more words they can read, the more knowledge they will have, facilitating better understanding and interactive communication. Life was good, we were all happy. James was just a kid at the local primary school. With 20 hours learning support per week, things ran fairly smoothly for him. Some of his behavior was baffling to the teaching staff as he would hide, or stuff toilet rolls down the toilets but in my view he was no more trouble than other children, he just did different things. I felt so happy, I took a part time job and obtained a qualification in counselling. When James went into the junior school things began to unravel. In years 4 and 5 he had a teacher who clearly felt that James should be in a special school. James picked up on this and our bright, lively, funny, confident boy became sullen and withdrawn and his behavior deteriorated fairly dramatically. This change in his behavior gave the teacher the reason she needed to recommend he move to special school. After a series of tedious meetings with professionals involved in James' case it became clear to us that there was also some political motivation at work. James' hitherto positive educational psychologist suddenly expressed her concern with his performance. When challenged she broke down and confessed that there was a hidden agenda, a local special school, with falling numbers, needing new recruits. Paul and I had spoken in the past about the possibility of moving near to the South coast one day and it occurred to us that this would be a good time to go. We chose Hampshire as we had heard good reports about the Education Authorities through the charity. James spent Year 6 at a village school in Hampshire, where his previous levels of confidence were restored and surpassed. In September 2003 he took up his place in mainstream senior school and is working his way rapidly through puberty and becoming a young man; a bit too rapidly for my liking! He recently said to me 'mum I think I'm at that age where I need a wife'. I asked him what for and he told me that he wanted "to have a bit of too-wit too-woo". I recall also that I came downstairs early one morning in the half term to be told by James that if the phone rang it would be the betting shop for him! He had been on www betting shop.com and placed a bet that Arsenal would beat Man U 3-0. Fortunately, he had completed the virtual betting slip incorrectly and my credit cards were safe. I now work 3 days a week at Down Syndrome Education International supporting the parents of very young children with Down syndrome drawing upon my experience as a mother who pretty much fell apart and was put back together and on the skills I acquired through my counselling qualification. And I like nothing better than to tell some of the parents about James' wit, humor, teenage moods, football fanaticism and huge amounts of love he brings to the family. When he came into our lives I asked "Why me? What have I done to deserve this?" Now I smile to myself and think, "Crikey, what have I done to deserve this?"